Each month, we take you Behind the Lines at Robins Air Force Base to feature the work of the 22,000 employees there. The jobs range from the exotic to the obscure, and some people do work similar to what we do at 13WMAZ. We visited the Air Force Reserve's Video Production Unit to see the many ways they share their mission and message. When we arrived, we watched what looked like a real broadcast. The host on the set said, "Good morning New York. Thank you so much for joining us today." There were lights, cameras, and technical difficulties; all elements of the broadcast business, but what we watched was not a real show. 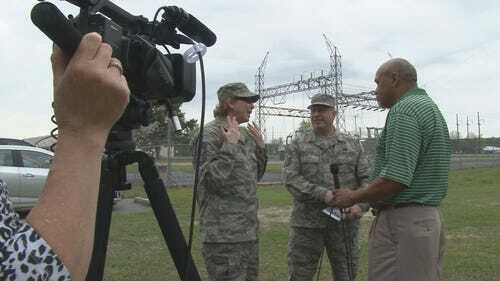 It was the Air Force Reserve's television training course, where high-ranking officers learn the ropes of responding to reporter questions. Trainers critique their performance and offer opportunity to improve. "It's the anxiety of being in front of a camera, in an environment where you really don't have a chance to practice," Philip Rhodes, a media specialist, said." Rhodes was guiding a group of Chief of Master Sergeants through the pressure of a press conference. "Get comfortable with the some of the things you might experience from a reporter," he said to one trainee. The work at the Video Production Shop goes far beyond training. Winfred Johnson directs real interviews from their fully equipped studio. Those can reach around the world, through military TV and online networks. "I been in places where people will never get to go, and a video camera got me there," Johnson said. He says he has shot classified clips and documentaries for military eyes only. Johnson has traveled the world to places like Tokyo, Turkey, Iraq and more. He filmed concerts performed for the troops. 13WMAZ tagged along on a few of those Operations Seasons Greetings tours. Military budget cuts ended them several years ago. "Our job isn't as big as it used to be," Johnson said. "Travel is a little tight now of days," Msgt. Chance Babin, a reporter, said. Babin shoots most of his stories, profiling airmen and their missions inside the United States. "We want everybody to know our story." That's a big job with only a handful of Air Force Reserve reporters throughout the U.S.," he said. Babin is a man of many talents, filming for TV, snapping still photography and writing for Reserve magazine, "The Citizen Airmen." The magazine goes out to 74,000 reservists, Babin said. The Production Unit puts out the news and information the Air Force reserve needs now, and equally as important, preserves their history through print and pictures. The Air Force Reserve production shop provides training to Airmen from across the country. The only similar set-up is a combat camera wing located at Hill Air Force Base in Utah.